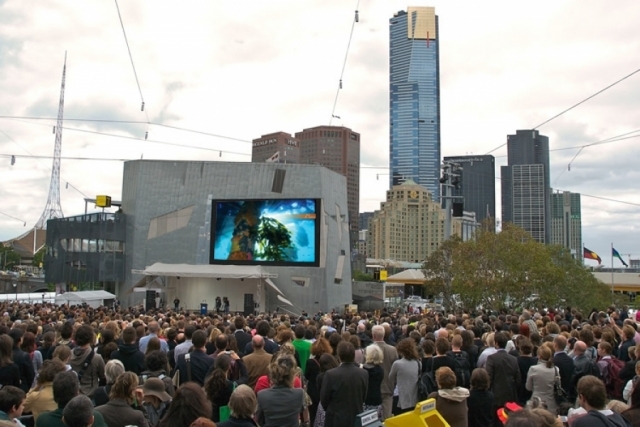 The Solution – Federation Square Big Screen. Imagine giant dolphins swimming amongst a bustling city metropolis, stingray soaring out of the depths of the Yarra River and the breathtaking sight of thousands of giant spider crabs migrating into the city centre. This is what you can expect to see thanks to the fab team at Federation Square. Fed Square is an icon of Melbourne, a vibrant meeting place and event space with an audience of millions. People from all walks of life, from all over the world converge here. For six months Port Phillip Bay will come to life through a series of one-minute vignettes inserted into the daily playlist on the big screen TV. There’s so much to see, so each month 3 new one-minute vignettes will be added to ensure that the footage is refreshed and to promote as many values of Port Phillip as possible while maintaining the interest of viewers. Imagery used will feature sub-titles that highlight the animals and areas in which they have been captured and conservation messaging.